Thank you letter is an important detail in business life. After a job interview, there are some important works and the details which to be thought on them. After every interview, you think the employer’s or Human Resources Specialist’s questions and your answers. Generally employers or Human Resources Specialists say that they will call you later. But sometimes they don’t call or send any message, e-mail. Instead of waiting them, you can call them or send an e-mail message to them. If you write a thank you letter to the person who you have an interview, it will be a very kindly behavior. With the help of this letter, you can show that how you give importance to that job interview and how eager you are. Also with this letter, you can be one step ahead from others. When you leave your interview, you think about it. 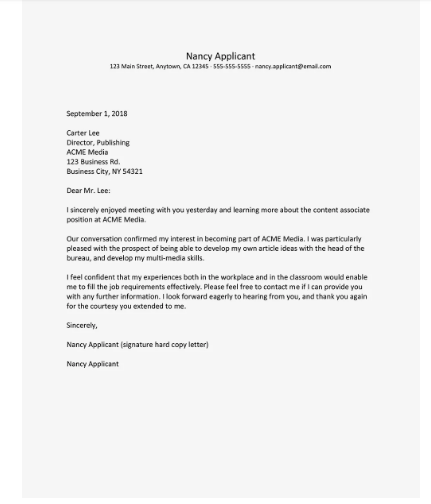 Maybe you say “I wish I had added my feature.” Thank you letter is a chance to say for you. You can say whatever you forget to say in the interview. Maybe you were excited or you forgot it. Whatever you want to say, you can write in your thank you letter. You also write a thank you letter to remind the interviewer of your conservation. Besides that this letter is a callback of your conservation. If you flub the answer to a question, you can express it. You can express yourself more easily and clearly. Also you reinforce your candidacy. You become a memorable candidate. You open the door for the future communications. 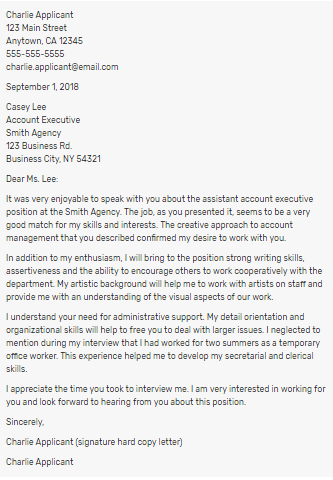 In your note, you mention your interest in the position. If this is your dream job, you can express it. If you send a note or email, you should certainly write “Thank You” in the subject of the message. It will be a kindly behavior. A targeted, personalized thank you note is much more meaningful than a generic one.